Next to the widely used long spine board, we developed a variant for in-hospital use. We began this development because we noticed the possibility of decubitus and the difficulty of radiological examination brought by fixating the patient on a long spine board according to ATLS. Traumatras® will bring a solutions for these complications. Traumatras® is the alternative for the long spine board in your emergency room. The Traumatras is developed by radiographers technicians. So, of course, all examinations (including CAT scan) can be performed. There will be no need to lift or reposition the patient. 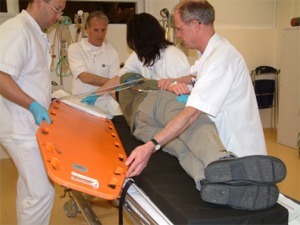 The Traumatras is not optimized for rescue situations, operating theatre or daily patient care. It will provide perfect patient handling, diagnosis and comfort during the first in-hospital hours.